Paranormal Affairs with Jami: Sneak peek of The Mating Challenge coming soon! Sneak peek of The Mating Challenge coming soon! Please enjoy this sneak peek of The Mating Challenge (book two of the Vanished series) to be released individually and as part of the Eros Indie Erotica Author Challenge. Andrea Slater escapes the prison of an underground compound only to be captured by a wild werewolf community that is convinced she has shifter blood. Six hot alpha males compete to claim her as her mate but can she submit to this new life and give up her freedom? Blake crept along the corridor keeping his packages behind him and his eyes on the destination. Andrea Slater and Mario Buckley were brave souls, but they wouldn’t have any luck if they couldn’t get the mission off the ground. His part was simple, theirs would be far more dangerous. All he needed to do was get them topside. The rest was up to them. “Okay, the coast is clear.” He motioned for them to follow him down the south corridor, their booted feet pounding the cement floor of the underground compound. Andrea made it to the keypad first and entered the code while Mario placed his hand on the glass plate and allowed his eye to be scanned. It was the reason he was chosen for this mission, he had the access to get topside and had no reason to stay here. Andrea was a different story. She couldn’t handle the rules of the compound. She’d been in and out of jail and psychiatric therapy, but nothing helped her overcome the loss of freedom. Her military training made her the perfect operative for this mission, and sending her to the surface was actually an act of mercy at this point. A shadow caught Blake’s attention from the left. He turned and aimed his weapon. Stun guns were the only firearms they were allowed in the compound. The theory was that humans were scarce and a commodity. They didn’t want to lose one to violence. “We’ve got company, hurry up and get out of here.” He whispered loud enough that Mario and Andrea could hear him and started down the hallway. “No, Blake. Melissa will kill me if anything happens to you.” Andrea grabbed his arm and pulled him back a step. Andrea looked at Blake who nodded. She conceded and went with Mario. They were right, they had to go. Hopefully whoever Blake was about to face was friend not foe. Andrea climbed the ladder first, and Mario followed her up. An alarm sounded as they closed the hatch which quickened their pace as they headed toward the Earth’s surface. They didn’t know what to expect when they got topside. If they listened to what they were told it was surely death, but if there was a chance that they could survive on the ground above, they needed to find out. It was dark when they managed to pry the second hatch open and step onto the planet’s exterior. They could barely make out the terrain, but the fresh smells that assaulted their nostrils urged them forward. Gone was the stale, recirculated air, replaced by sweetness and moisture. The coolness of the brisk wind reminded her of her time, long ago, before she was abducted from the past and taken to the future to reproduce human children to repopulate the Earth. It all sounded like a noble cause. The only problem is the way they were going about achieving their goals. Kidnapping, drugging, using compulsion to control them, and forcing them into holding cells they claimed were apartments. There had to be a better place, and she really hoped it would be here. Their eyes quickly adjusted to the silvery light that came from the full moon and focused on their surroundings. “Let’s head to the mountainous area over there. Perhaps there is a cave we can take cover in.” Mario suggested. “Good idea.” She lifted her backpack onto her shoulder and unholstered her stun gun. She felt better knowing she had some way to defend herself. The rumors of the dangers topside included zombie clone husks, demons, shifters and other paranormal creatures. All of the stories were meant to instill fear in the heart of humans to deter them from trying to escape, but as uncommon sounds of wild creatures echoed in the distance she couldn’t help but wonder how many of those supernatural beings actually existed. Probably most of them since the compound they just left was full of vampires, shifters, cyborgs and humans. They took off at a steady jog toward the mountains, keeping their eyes to the periphery to make sure there weren’t any shadows following them. It was eerily quiet for what they were expecting. It was less than two clicks before the hair on the back of Andrea’s neck rose. It was the feeling that she was being watched. She stopped and narrowed her eyes on the horizon, looking for anything out of the ordinary. “Andie, what are you doing?” Mario stopped and turned in her direction after her footfalls diminished behind him. “Right. Okay, let’s go,” she took off at a steady run, quickening her earlier pace as dread twisted slowly up her spine. Something was wrong, instinct told her to be on guard. But whatever the threat was, it was not visible to her yet. “Let’s just hurry and take cover.” Andrea turned as something hard slammed against her face, and her knees buckled underneath her. She turned to warn Mario, but as darkness narrowed her vision she saw he was being attacked. The last thing she remembered before she slipped into unconsciousness was a wooden spear sticking out of his chest and the life leaving his eyes as he fell face-first into the dusty ground. 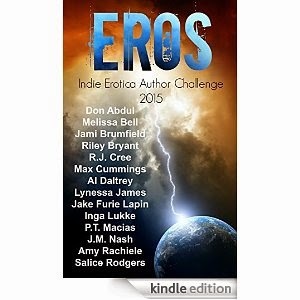 The amazing box set Eros is available for only $0.99 on pre-order from Amazon now. I'm so proud to be a part of this awesome box set with these amazing authors, Don Abdul, Melissa Bell, Riley Bryant, R.J. Cree, Max Cummings, Al Daltrey, Lynessa James, Jake Furie Lapin, Inga Lykke, P.T. Macias, J.M. Nash, Amy Rachiele and Salice Rodgers. Check it out it's definitely worth a one click. Please note this story and the Eros box set is intended for readers 18 and older.